It appears that after years of providing a clunky and unintuitive keyword segmentation experience, that the Google AdWords Keyword Tab is, yes, finally getting a much needed usability facelift. As a comparison, here is an example of the one that’s been around for a while. 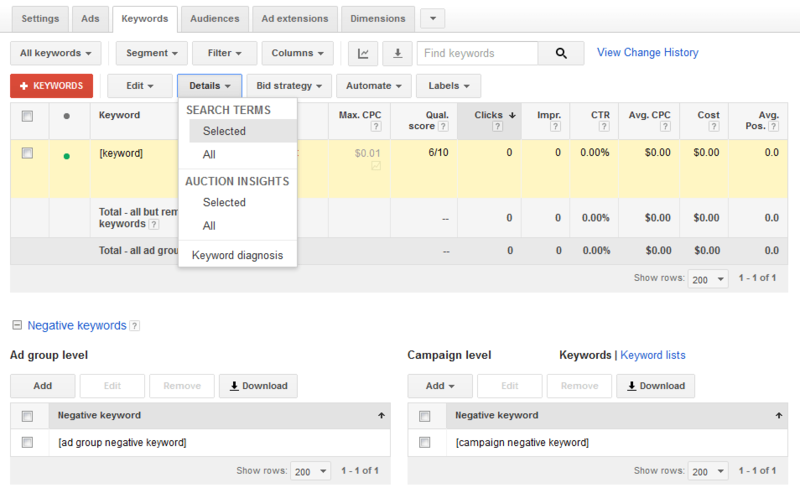 You can see that the original has the Negative Keywords on the same page as the Keywords you are targeting, and the Search Term report is accessible through the “Details” dropdown menu option. The biggest navigation change came with the addition of 3 buttons at the top that now segments the different keyword types onto different pages: Keywords, Negative Keywords, and Search Terms. The second “Search Terms” button next to the old “Details” dropdown menu is a little redundant as it leads to the same place as the button with the same name at the top does. My guess is this is to assist pay per click marketing professionals who’ve been dealing with the old layout find the Search Term report easier without getting lost. After the nav update, the best part of the change came from giving the Negative Keywords their own page. Gone are the days of scrolling down to the bottom of a large keyword list just to access your negative keywords. The is a much better user experience IMHO. New Google AdWords Negative Keywords page. Adding a total number of keywords that were selected for this report (2 keywords were selected) and a link to “show all”. 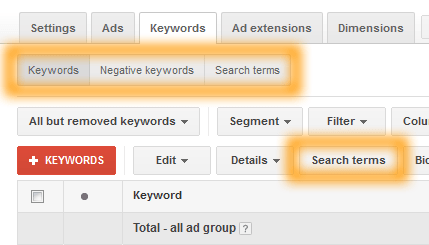 Moving the “Download” button from the right side of the “Add as Keyword” and “Add as Negative Keyword” buttons, up to the right of the “Segment”, “Filter” and “Columns” dropdown menus where it’s commonly found throughout the rest of AdWords. 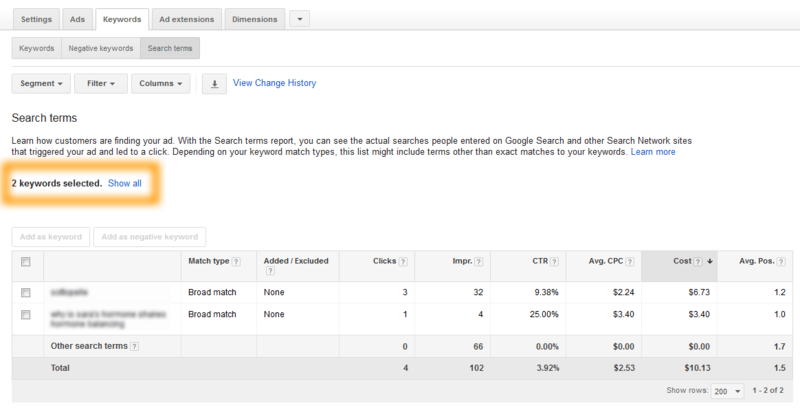 Here is the original Search Term report page for a comparison. As a self proclaimed power-user of Negative Keywords and Search Term reports, this update is greatly welcome. It’s more intuitive and will help PPC advertisers navigate their accounts easier, saving time and frustration. Great find. I am definitely in search terms everyday so this is really cool to see, much more intuitive.